Rob is one of the band's managers, President of the organization's society, and an original competing member of the band from 1981 through the 1980s. In the late 1980s he led the SFU Grade 2 band to the top rank in western North America. Since the early 1990s, he has directed his talents to the organization's administration including project management of ten of the band's Highland Arts Festivals across North America and nine of the band's audio and video recordings. 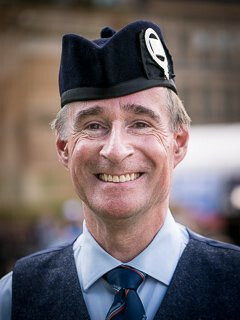 Many of Rob's compositions have been played by the band over the years and he has also been an instructor in the Robert Malcolm Memorial Pipe Band organization.